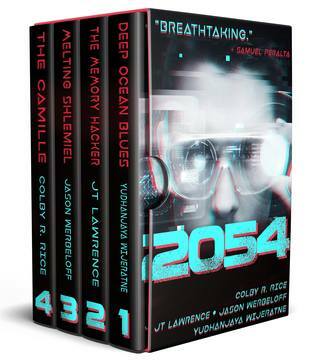 This is the first novella in the futuristic visionary collection “2054” from a diverse quartet of authors. It’s the year 2054 and fossil fuels are scarce. So the world turned to thorium, an atomic fuel that is non-weaponisable. Below the waters of the Bay of Bengal, some four kilometres down, are the rigs of the Bay of Bengal Corporation, an Indo-China concern, busily mining the thorium-containing monazite deposits. Unfortunately, an automated system above a certain size requires a human presence. Enter Parul Anand, human operator of Rig #443. 3D-printed on the rig while her real body is put on ice Topside (or is it? ), with brain patterns transferred, and extra mechanical arms installed. Speaking of which, I never uncovered the reason for the extra mechanical arms, except their role as stabilisers after a hard night’s drinking was clearly illustrated. Maintaining the rig along with her is an army of cephalopods – octopuses, to be precise – called OctoPods and given unit numbers as businesses are wont to do, who have been bioengineered for their maintenance role – able to receive and follow instructions, and carry out basic repair and maintenance tasks. In this cyberpunk vision of the near future, Wijeratne explores the relationship between humanity and nature, as well as that between humans and AI. I really liked the underwater setting, and the envisioned technologies used in the story. Especially the way in which current technologies are utilised and extended within the setting. In some ways, the underwater setting of this story reminded me of The Abyss. A lot of fun, with some dark elements too. And a very endearing octopod.